Careene Reid, far left, said she’s had to work two jobs to help pay her bills. She was one of several nursing home workers who advocated Monday for higher wages. Members of the state’s largest health care employees’ union said Monday they would strike at the beginning of next month if tens of millions of dollars aren’t added to the state budget to support the increases. About 2,500 workers across 20 Connecticut nursing homes, based largely in cities, voted in favor of the strike. The union warned last week that thousands of employees could soon be on the brink of a strike. Members at 20 nursing homes escalated that threat Monday by revealing they had voted 1,449 to 78 in favor of the strike, setting a May 1 deadline. The union has recommended a 4 percent raise for all nursing home caregivers industrywide – including non-bargaining workers – in each of the next two fiscal years. This would cost $40 million annually, labor officials said. About half of that would be borne by the state and half would be covered by federal Medicaid payments to Connecticut. It wasn’t clear Monday how much it would cost the state should lawmakers opt to provide raises only at the nursing homes threatening to strike, or only at the unionized facilities. During some previous strike threats, lawmakers have debated covering raises only for unionized nursing homes. The Connecticut Department of Social Services is required to reassess nursing home costs at least once every four years, and to provide inflationary increases to homes in the years when a formal reassessment isn’t done.The industry did receive a 2 percent increase in state funding this fiscal year and a 3 percent increase in 2015-16. But governors and legislatures often skip this inflationary adjustment in tough economic times. Lamont has proposed waiving it next year and in 2021. Nursing homes would lose out on $28.8 million next year and $61.2 million in 2021 if lawmakers agree to waive it. Caregivers who packed a hearing room at the state’s Legislative Office Building Monday said they’re chronically stressed and underpaid. One worker, a certified nursing assistant at Trinity Hill Care Center in Hartford, described the ordeal of having to take on a second job to cover “basic” necessities. 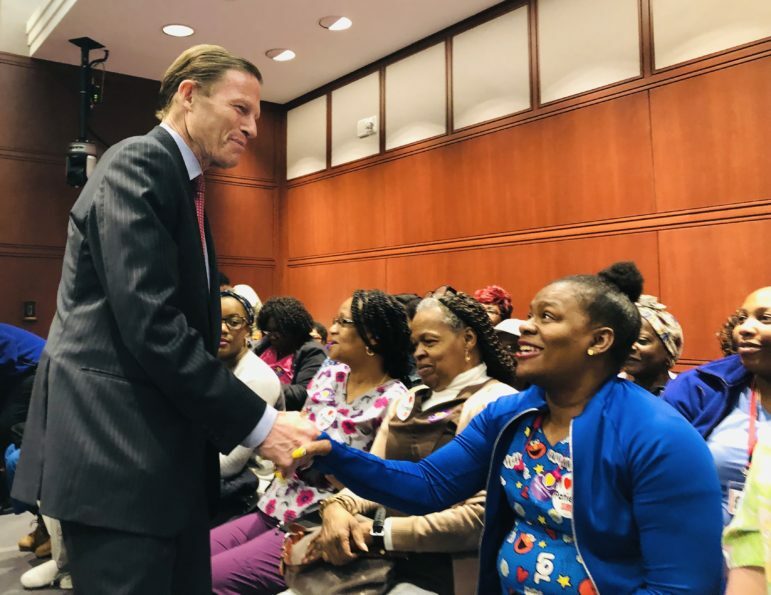 Sen. Richard Blumenthal greeted nursing home workers who were arguing for pay raises Monday. State Sen. Saud Anwar, D-South Windsor, ticked off a list of possible consequences should staffing levels drop even lower during a strike. Matthew Barrett, president and CEO of the Connecticut Association of Health Care Facilities, told the CT Mirror last week that nursing home residents experience trauma and anxiety when separated from their caregivers during a labor dispute. Lamont and legislators are struggling to close major deficits projected for each of the next two fiscal years. Spending — unless adjusted — is on pace to exceed revenues by $1.7 billion next year and by $2 billion in 2021. 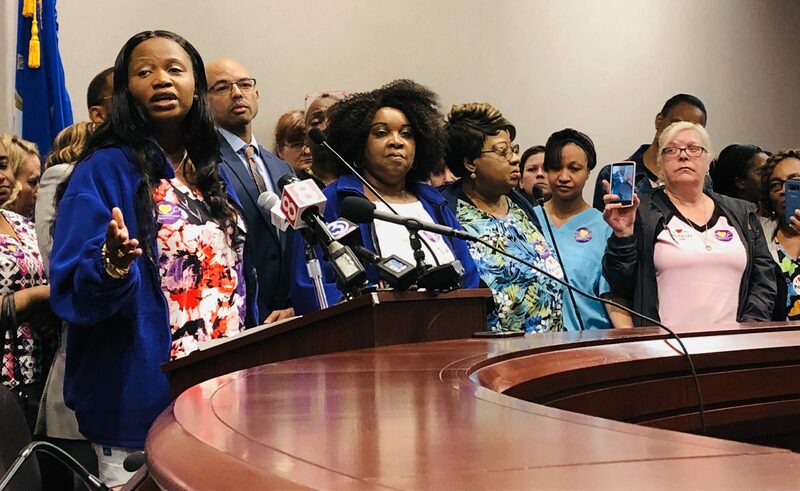 Still, Rep. Robyn Porter, D-New Haven, said lawmakers and the governor should be able to find $40 million for nursing home workers in each of the next two years. Porter, who co-chairs the Labor and Public Employees Committee and also serves on the budget-writing Appropriations Committee, said she favors raising taxes on the wealthy — but declined to predict what her colleagues might do. Jenna Carlesso is CT Mirror’s Health Reporter, focusing on health access, affordability, quality, equity and disparities, social determinants of health, health system planning, infrastructure, processes, information systems, and other health policy. Before joining CT Mirror Jenna was a reporter at The Hartford Courant for 10 years, where she consistently won statewide and regional awards. Jenna has a Master of Science degree in Interactive Media from Quinnipiac University and a Bachelor or Arts degree in Journalism from Grand Valley State University.